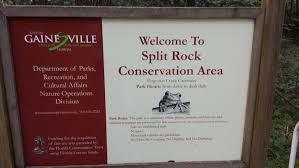 Limited access by walking or bicycles only; no parking is availableWe are pleased to announce that a new pedestrian/bicycle entrance to Split Rock Conservation Area is open for public use. The entrance is located just north of the Portofino neighborhood on SW 20th Avenue and is easily reached from RTS bus route 76. We invite you to come and explore the trails in this beautiful natural area! If you have any questions, please contact us at 352-393-5067.